I don’t relish writing this post. In fact, I seriously wish I didn’t need to. But sadly, I do, because this twisted behavior of vaccine pushers must come to light. Last night (5/27) I was given a 24-hour Facebook ban…my first, actually. Many advocates have faced several, but I had not. And why, you ask? What did I do or say that was so atrocious? This did not name, but was referring to the Ohio AAP CEO. I had requested that people respectfully send her scientific studies about vaccines. What has followed is nothing short of madness. The vaccine pushers have woven a masterful tale. An entirely fictional tale, but I’ll let the readers examine it all and decide for themselves how to feel. In their version, the Ohio AAP was just minding their own business, working tirelessly to improve the lives of children everywhere, when I, irrationally and unprovoked, started viciously attacking them. I did this because I’m mentally unbalanced and can’t stand that they actually want to help children. I want to sell them false hopes and snake oils, so, you see, I have to take them down. Every single comment that anyone made in opposition to HB559 was deleted. Anyone who asked why comments were being deleted, was deleted, and they were banned. Some people who simply reacted to posts with an angry face were banned too. Regardless of how the Ohio AAP feels, however, we, as citizens, have every right to weigh in on new bills that would limit our choices. It’s called being politically active. Surely they don’t expect to push a new bill through unopposed? Several troll groups got involved. In their version of the story, beyond my vicious and unprovoked attack (see above for what I said…), I have continued to bully and harass people, and I am mentally unbalanced. I have had no contact with the Ohio AAP other than what is shared above, and also asking them if they were deleting comments and suggesting that this was unprofessional. I have written this post about the new bill. That’s about it. I have never spoken to any of the members personally, not via phone, email, or in person. I have not commented on their personal Facebook profiles. Any communication I chose to engage in would be as respectful and appropriate as what I commented above. They have created several new Facebook groups and pages dedicated to me. I won’t link them, but I will name some. Visit them at your own risk. There are others that frequently talk about me but weren’t dedicated entirely to me (the last two would fall in that bunch). On these pages, they illegally steal my images, create memes from my pictures, call me names, slander me. They use fake profiles to sneak into my group and onto my pages, and they use these profiles to take screenshots of things that I, or other group members post to mock us. They do these things…and then paint themselves as victims when we dare to call them out for this behavior. It’s because they are narcissists who have written down everything that they are…and assigned it to me. Don’t take my word for it; go have a peek at some of those groups. Just remember that you’re about to see some of the worst that humanity has to offer, and you can’t unsee it. The irony is breathtaking. They’re allowed to literally create hate groups centered around individuals and this is fine with Facebook’s community standards (we’ve reported them and have been told they are not in violation). But my comment about helping educate was clearly horribly offensive. Facebook has no standards; they just delete whatever enough people complain about and ignore everything else. This is what we have to face, just for daring to speak out about alternative choices. The point where I get involved is where they try to encroach on my rights. That’s what’s happening here, with this new bill. It’s the sole reason I’m speaking out. They, however, do not feel the same way. They speak out just because we live our lives differently. It isn’t okay with them that we exist. That’s very, very sad. By the way, there are medical professionals who are members of these groups. Are these the people you trust to care for your child? Would you feel comfortable going to see a doctor or a nurse if you knew that your office visit story would end up on an internet forum, where you got mocked mercilessly? Essentially, instead of learning about the safety studies and actual science surrounding vaccines, they learn how to coerce parents into vaccinating. This is far from the only conference teaching this. If you were on the fence about vaccines, would you feel okay seeing a doctor who was more interested in convincing you to vaccinate than in answering your legitimate questions? I wouldn’t. I encourage everyone to flood the AAP with letters about your disappointment in their conduct, and link scientific studies about vaccines. Please continue to contact your state representatives, too, if you are in Ohio. Rather, we should understand there are things that Western medicine is good for (trauma, accidents, life-or-death situations) and things that they are not good for (general health promotion, diet, management of many chronic conditions, treating many acute conditions…). Western medicine deserves credit where credit is due, but it is not the be-all-end-all of life. There are many other options for health care, and there should be. Also, because of the trolling activity and Facebook’s censorship (that’s a long story), if you want to be sure to hear from us, please sign up for our mailing list. We’ll even give you a free vaccine guide for it. 🙂 This is the only way to be sure that you get the information you want…without the bullying. 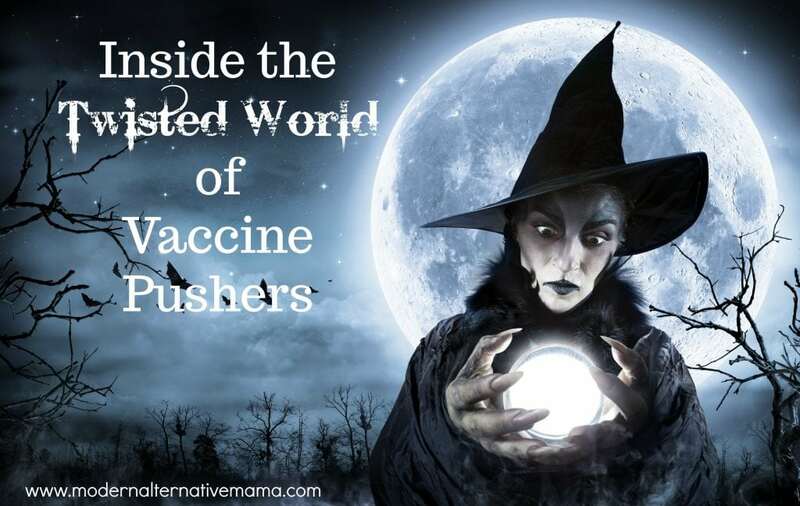 Now that you’ve seen it all, how do you feel about vaccine pushers? I wanted to post this on you Facebook page but you blocked me when I disagreed with you. You posted the CEO’s email. This by Facebook standards is doxxing. You are in “Facebook Jail” for doxxing. This has nothing to do with you personal stances. I did not block you from the FB page, and my admin team wouldn’t have unless you were rude. I posted, several days ago, the CEO’s PUBLICLY AVAILABLE email address. Nothing private, nothing one couldn’t find from a simple google search. I never did and never would post one’s personal email or other contact information. Additionally, that’s not why I was blocked. I was blocked because of the statement shown in the screenshot. Which does not contain any personal information, was not harassing anyone, and should never have been removed. But go ahead and keep telling yourself that it was something more. It wasn’t. I already didn’t trust doctors from a myriad of personal experiences, and this behavior by the AAP has only reinforced my low opinion of them. Kate, Thank you for the work you tirelessly do to empower families. It is very hard role to speak up publicly on this issue. I am sorry you have experienced this; thank you for sharing about it. I am fearful of discussing my choices and what I have learned with all but those closest to me, because of the potential for vicious backlash. So many of us appreciate your work and bravery. Take heart! Wow. This is absolutely disturbing. Please be encouraged, and know that you are not alone. In North Carolina the Bar Association is filing a claim (baseless of course) against Alan Phillips, a vaccine rights advocate and attorney in an attempt to access his client files. It’s possible big Pharma is starting to panic because more and more people are starting to question the efficacy of vaccines vs. their known dangerous, and sometimes deadly, side effects. Facebook is also notorious for blocking people, groups, etc… that post information that is against “their” interest. “Their interests” meaning their investors. It’s possible big Pharma spends a significant amount of money advertising on Facebook, which translates into significant money for Facebook. Perhaps consider another platform in the interim? In fact, I don’t doubt that the first person to comment “Denise”, on this article is likely a vaccine pusher. Again,Stay encouraged. Your information and this page is a blessing to many, including me. Here is an excellent platform to share your wisdom and help others. I agree with you, and the immature behavior of some of these medical professionals, is disappointing, to say the least. If we all refuse to vaccinate, diseases, such as polio, would eventually return. The only reason that some people, in this present age, can afford not to vaccinate at all, is because “most” people are vaccinated, and thus, exposure to these diseases, in America, is very very low. One of my best girlfriends did not vaccinate her child at all, and I have had patients that I have supported in making the same decision, because, I whole-heartedly believe in everyone’s ability to make their own decisions. Anyway, I just wanted to see what you think on this side of the matter, because, I really do not want to live in an America where I have to worry about my child dying from, or becoming forever crippled from, one of those diseases that have been nearly irradiated. I definitely feel it’s a tough topic that puts me between a rock and a hard place, especially as a pediatric professional. I think the really sad thing is they post photos of your baby and call him names etc. They also claim that this started because the bill in question… but they have been in these groups a few years now. It’s super pathetic. I’m surprised you haven’t filed harassment charges. Stay strong! Someone needs to speak up. Too many people don’t care or don’t know about the truth. Thank you for your courage!